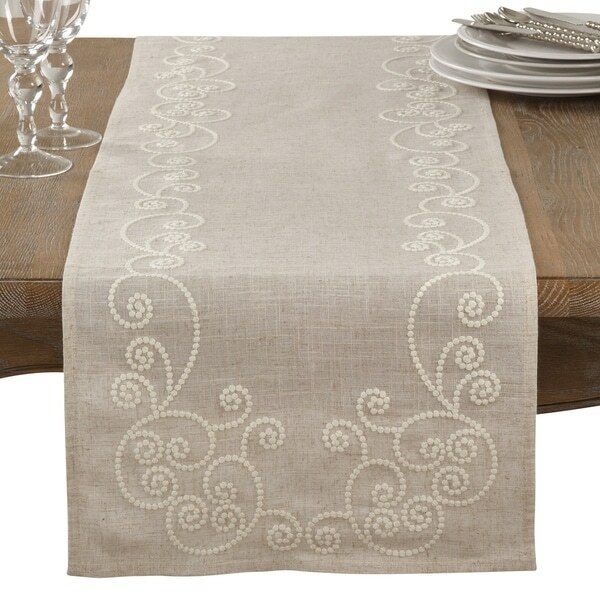 Whimsical embroidered swirls bring a playful quality to this table runner from Saro Lifestyle in a linen-blend construction for a natural, everyday look. Dimensions 72.0 In. X 16.0 In. X 1.0 In. I am absolutely in love with this runner! It’s so light weight and dainty, and my goodness the embroidery on it is so delicate and truly lovely. The embroidery reminds me of the work you see on a lot of very pricey vintage pieces. I love how versatile this table runner is, I can dress it up or I can dress it down and It goes so nicely with all my French farmhouse decor. It actually brings back memory’s of sitting and watching my grandmother embroider when I was a child and would get to stay with her a while. To me this runner is more than just another pretty thing in my house, it’s a memory holder and a story for my grandkids. I would definitely recommend ordering things sometimes cause it gives you an emotional feeling and brings back some nostalgia, that’s what this great piece did for me! Another happy purchase for me! Thanks Overstock.com! Love the color and the patterns on the linen, the material feels good.I can't wait to show it of to my friends. These table runners are so simple but beautiful , i love the linen look and summery feel to them,so happy with the purchase of them!!! I was uncertain when i ordered this table runner. It took awhile to arrive, but it was worth the wait. The color was exactly what I expected. Very happy with the embroidery. The weight of the linen is perfect. I would definitely recommend this runner! This is a lovely runner--understated elegance for a luncheon or day to day decor. it is a natural color and would like to see it available in stark white! Good buy or the price. Beautiful design. Good quality at a reasonable praaice. Very nice, good quality, and exactly as shown. The wife was looking for a nice table runner. So many other sites had runners that were over priced, but this was an excellent value. Would order again and and order other runners from Overstock for a variety to change occasionally. Arrived on time and in perfect condition. The table runner is a absolute beautiful piece and the embroidery is just as stunning and well done. The table runner is well made and I have been complimented on the table runner often. Lovely! A dream on the table, and very easy to care for. This is a very beautiful runnier I just wish it was a bit thicker, overall am loving the color as well as the embroidery around it very nice. I love this color goes perfect with the colors in my formal living and dining. The runner was the perfect size and looks just as it is pictured. It arrived in a timely fashion as well. Very pleased! I bought this to match other pieces. This is linen with the design all done in embroidery. I gave only 4 stars because it does not lay completely flat everywhere because of the embroidery. Very pretty and delicate. Looks great on my table! It matches my other table linens. I t was a great buy! The color is exactly what am looking for, and the beautiful embroidery around it looks great! I can’t wait to get my order am so excited overstocked is always on point with fabulous product! I love shopping with you guys so much simply the best.